With the non-WWE festivities surrounding WrestleMania now expanding to what has become nearly a full week of shows, promotions and wrestlers are afforded more opportunities than ever to prove themselves in front of some of the biggest crowds they'll see all year. EVOLVE kicked things off in Orlando with the first major show of the week that was streamed live. And by the time EVOLVE 80 was over, a clear candidate had emerged as the early breakout star of WrestleMania weekend. With Ricochet helping to get the most out of him, Keith Lee had his best match since arriving in EVOLVE and came off as a star. Their styles seemed like they would mesh effortlessly before it even began, and the results were as expected. Lee used his power while Ricochet relied on his quickness and athleticism, though Lee attempted to keep up with him at points. In the end, Ricochet won after needing a springboard 450 splash, two shooting star presses, and a 630 to get the job done. Lee attempted to fight back after the second SSP, but Ricochet connected with strikes to keep the advantage. Lee looked great even in defeat. While it would've been ideal for him to win, this did more for him than beating almost anyone else on the roster would have. 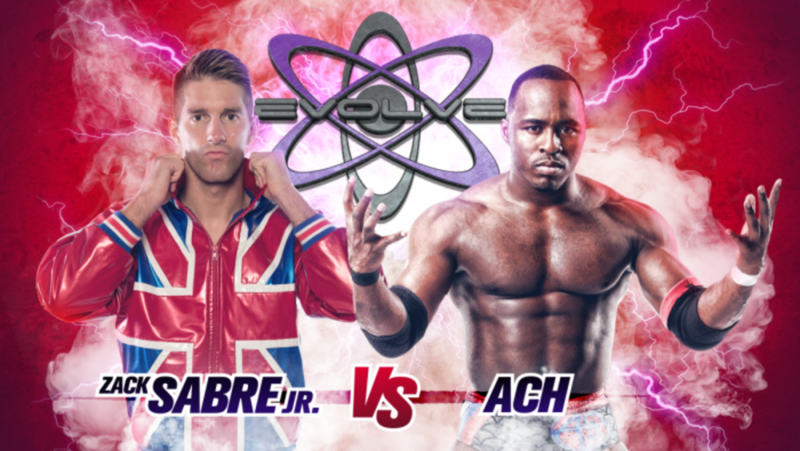 ACH also had his best EVOLVE showing yet against Zack Sabre Jr. in the main event. They had the type of excellent back and forth title match that had been missing on most EVOLVE shows during Timothy Thatcher's reign as champion, with Sabre retaining at its conclusion. During the closing stretch, Sabre kicked out of ACH's brainbuster. ACH got caught in a triangle choke after trying to follow up with a 450. He tried to power out, but ZSJ was able to trap him in a double armbar for the submission. Though he kept his title, Sabre didn't end the night on a high note. He was cutting a promo about his upcoming matches in Orlando when Michael Elgin came out to ask if Sabre would put his championship on the line when they face off tomorrow. Sabre said that he'd defend against anyone before Elgin laid him out to close the show. Elgin teamed with Donovan Dijak in the semi-main event as they debuted by challenging Tracy Williams & Fred Yehi for their tag titles. The champions retained, though the challengers worked pretty well together. Williams and Yehi hit a double team powerbomb on Dijak, then Williams transitioned into a crossface. Dijak tried to get to his feet until Yehi dropkicked his knees and he fell back down to the mat and tapped out. The night opened with Drew Galloway picking up a surprisingly dominant win over Matt Riddle. Their grudge match was as advertised with intense brawling on the floor. Galloway piledrove Riddle through a table and shortly after hit a Future Shock DDT and another piledriver for the victory. That evened things for Galloway, who lost his last match to Riddle by ref stoppage. They'll both be in the elimination match to crown the first WWN Champion at Saturday night's Supershow. Chris Dickinson and Jaka made the save for Riddle after his loss, but they were the only Catch Point members to come to his aid. Larry Dallas brought up Williams and Yehi's absence after their tag title defense, attempting to create more tension within Catch Point. His efforts seemed to be effective as Dickinson and Jaka questioned when they would get their tag title shot. Ethan Page and his Gatekeepers worked together as a more cohesive unit, though their troubles came externally. The Gatekeepers first demolished Facade and Michael Richard Blaze (who had attended the WWN seminar earlier in the day) and Page beat Austin Theory with the spinning Dwayne. Page got on the mic after, vowing to continue bringing chaos throughout the weekend if he isn't given an EVOLVE title shot. He threatened to ruin EVOLVE's business relationship with PROGRESS until he was interrupted by Priscilla Kelly. A group of people dressed up as medics wearing face paint entered with a body bag like the one that Page and The Gatekeepers last left Darby Allin in. Page and The Gatekeepers didn't want to open it at first, instead trying to destroy it and throwing it to the outside. They finally relented, and Allin emerged with a metal pipe to run them off. He challenged Page to an anything goes match tomorrow and Page accepted. Elsewhere on the show, Jaka vs. Jason Kincaid was turned into a surprise three-way bout with the addition of Lio Rush at the last minute. With his EVOLVE return pushed up a day, Rush showcased his offense and won by hitting the Rush Hour on Kincaid, connecting on a suicide dive to the outside on Jaka, and seamlessly coming back in with a frog splash on Kincaid. Timothy Thatcher appeared for the first time since his marathon reign as EVOLVE Champion ended. He defeated Chris Dickinson with a choke to regain some momentum. Dickinson's intensity served as a good matchup for Thatcher, and the show was less reliant on Thatcher having a great match now that he's without the title. This was a good way to start WrestleMania week off. Lee vs. Ricochet and Sabre Jr. vs. ACH were both great matches that should still be remembered by the time everything in Orlando is over. Nothing else was at that level, but Friday's card looks deeper on paper, with ZSJ vs. Elgin, Riddle vs. Yehi, Page vs. Allin, Lee vs. Dijak, and Galloway vs. Rush.